Since its introduction more than 50 years ago, Ford Mustang has given enthusiasts the opportunity to personalize their ride in ways no other vehicle could offer. Whether it’s the mighty Boss 302 or the 1968 Pony edition, powerful V8s and racing stripes, trick shifters, custom wheels and more – personalization has always been big for Mustang fans. 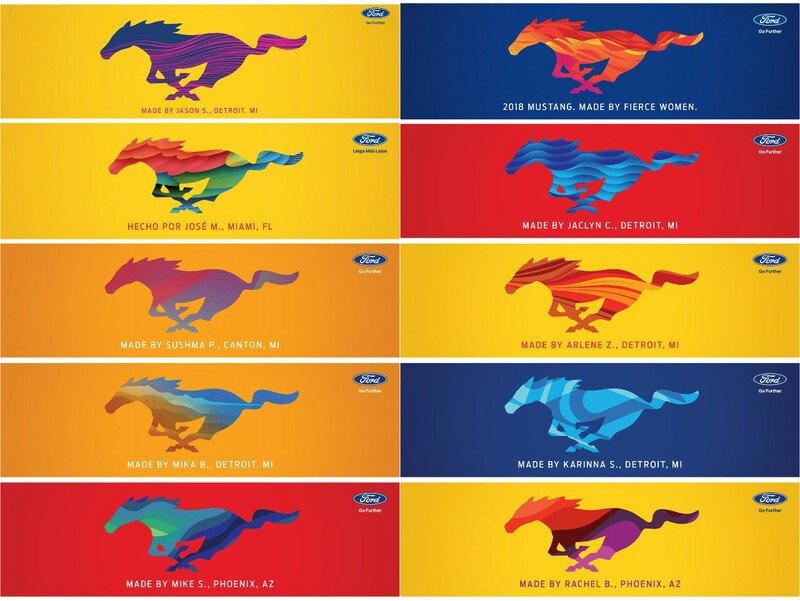 Now, in celebration of the 2018 model – which offers more personalization than ever before – fans can create and share Mustang art through the Personalize Your Pony experience on Facebook. The experience allows fans to create personalized pony art right on their Facebook pages, then use their designs to order prints, clothing and even a limited-edition grille badge for their late-model Mustang. From March until June, some designs could even appear on billboards in major cities across the U.S. Facebook users can find the experience by typing “Ford Mustang” in the Facebook search bar, or go to www.Facebook.com/FordMustang. Fans can create their designs using style packs and colors, with editing capabilities to further change color, density and blending available. Style packs include Mustang variants from Shelby, Roush, Bullitt* and RTR Vehicles. Each pack provides a set of color themes representative of its brand. Mustang enthusiasts and performance icons Ken Block and Vaughn Gittin Jr., and YouTube star David “ThatDudeinBlue” Patterson are joining in to create their own pony designs. The redesigned 2018 Ford Mustang offers more ways for customers to personalize their car than ever. Elevating the driving senses – sight, sound and feel – Mustang can change attitudes and colors with a simple flick of a switch. An all-new, all-digital 12-inch LCD instrument cluster with MyColor can change colors and gauge layouts based on what a customer likes to see, as well as modify and save a driver’s favorite vehicle settings through MyMode. Mustang adds a new drag strip mode for 2018, which can help customers achieve their best quarter-mile times and elevates the drive experience. A class-exclusive quad-tip fully variable active valve performance exhaust system that changes the exhaust note based on selected drive mode can be personalized, including with a clock-configurable quiet start feature that allows customers to set times when the car will start up in quiet mode. **Custom grille badges are a limited time offer only. Customer is responsible for safe installation, which may void certain manufacturer warranties. Exhaust system claim based on high-power sports car comparisons based on Ford segmentation.